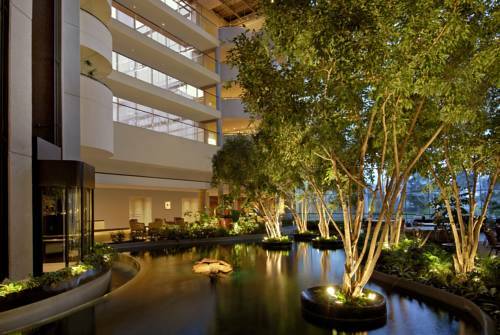 The Omni Houston hotel at Westside is a Four-Diamond gem set in a tropical paradise of water gardens and cascading waterfalls plus lush exotic foliage which features an indoor Koi fish pond. This spectacular luxury hotel is surrounded by a two acre lake yet is only minutes from downtown Houston and Minute Maid Park plus Toyota Center and Reliant Stadium as well as the George R. Brown convention center. Glass elevators whisk guests from the atrium lobby to elegantly furnished renovated guest rooms offering such luxurious amenities as well as state-of-the-art technology including wireless high-speed internet access and personalized voice mail and on-demand movies. Guests may lounge next to the outdoor swimming pool or relax in the whirlpool or explore nearby jogging trails or use the full-service fitness center featuring modern equipment and LCD TVs. Nearby freeways offer convenient access to local business parks and shopping plus dining and entertainment as well as the two major airports. Four-Diamond luxurious comfort embraces style. Hotel is 100 percent non-smoking. Welcome to Omni Hotels and Resorts. Located on Eldridge Parkway at I10 West in the heart of the Energy Corridor in West Houston. The hotel's location offers convenient access to premier shopping, restaurants, sporting venues, cultural events and museums. The hotel is 34 miles from George Bush Intercontinental Airport and 33 miles from William P Hobby Airport. Located in the dramatic atrium garden surrounded by tropical foliage and waterfalls the casual Cafe On the Lake offers a varied menu ranging from hearty pasta dishes to sizzling steaks and fajitas. The fresh seafood is a menu highlight. The Black Gold bar is a favorite watering hole for Houston locals. Enjoy Texas-size Margaritas and snacks in this casual saloon-style lounge. Our unique Omni Coffee shop offers gourmet coffee-sandwiches and snacks. A computer, internet access and printing are also available for a nominal charge. While in Morsels guests will also find travel essentials plus sundries and souvenirs.